businesses adopt measures such as rationalization and automation ... The construction management process is a necessary proce- .... Construction marketing. approaches to reengineering, the obliteration approach and the best practices .... process is in the case of a help desk. .... accommodate the ERP software. poration by Hammer and Champy (1993), concen- trates almost exclusively on the design step, whereas traditional Operations Management teach-. May 4, 2001 - Performance Management and Measurement - mike perm paper .... moving toward its strategic goals (Gentia Software 1998 p5). Indeed ..... Gaiss, M. (1998) Enterprise Performance Measurement, Management Accounting,. 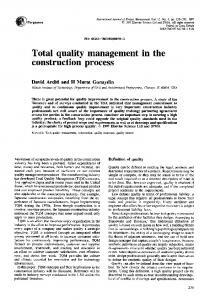 Total quality management in construction: D Arditi and H M Gunaydin of construction, ease ... According to an. ASCE study, 2 quality can be characterized as follows. ... use in the public sector and, to a large degree, in the private sector, of the. 5. Cam for stroke adj. DSA. 1 Stainless Steel. UNS A13600, ASTM B85. -. 6. Shaftpin for stroke adj. DSA. 1 Chrome nickel steel. UNS G10860, ASTM A228. Received November 10th, 2012; revised December 8th, 2012; accepted December 15th, 2012 ... lancers. Moreover, there are public debates on the free-. 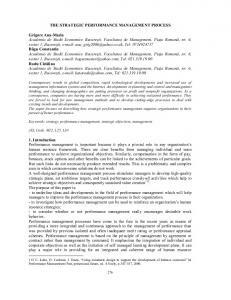 This study develops a construction management process reengineering performance measurement. (CMPRPM) model .... Effectiveness is the degree to which a.
a b s t r a c t This study develops a construction management process reengineering performance measurement (CMPRPM) model based on an application of business process reengineering philosophy. Process operation time and customer satisfaction are used as efﬁciency and effectiveness evaluation indices. The CMPRPM model applies queuing theory to calculate process operation time in order to strike an optimal balance between process execution demand and manpower service capacity. In order to achieve customer satisfaction, customer demands are identiﬁed and a target attainability index is used to calculate process effectiveness. After integrating efﬁciency and effectiveness evaluation results, indices of process value (PV) and value improvement (VI) are proposed to allow performance prior to and after reengineering to be measured and compared. The proposed CMPRPM model addresses the performance of initial (“As-Is”) and signiﬁcantly reengineered (“To-Be”) processes to facilitate successful BPR design. Results show that the construction industry stands to beneﬁt signiﬁcantly in terms of a successful BPR design by adopting the model proposed in this paper. Crown Copyright © 2008 Published by Elsevier B.V. All rights reserved. ⁎ Corresponding author. Tel. : +886 2 27376663; fax: +886 2 27301074. E-mail addresses: [email protected] (M.Y. Cheng), [email protected] (H.C. Tsai). and increase the likelihood of success; although risks of loss remain high if not properly implemented. The potential for BPR in the construction industry should take into consideration core issues of concern to participants, who include clients, designers, suppliers, specialists and contractors, in order to help formulate objectives within an integrated strategy [4,5]. The effective scope of BPR should also be identiﬁed . Brown and Marston  described how successful BPR lead to successful improvement efforts at the Tennessee Department of Transportation by focusing on the project-development process for new construction. Abdul-Hadi et al. described 29 prioritizing barriers in their investigations of the Saudi Arabian construction industry, which were ranked according to order of difﬁculty and importance to BPR implementation success. An evaluation method for business improvement should be developed to reduce risks associated with the BPR process and increase the likelihood of BPR success. Predicting quantitatively the effect of an improvement approach facilitates model construction better . The balanced scorecard philosophy also provides an alternative to develop business process evaluation methods [10,11]. 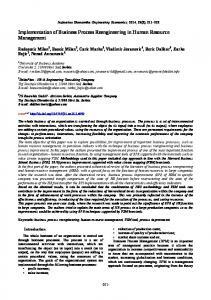 This paper discusses the application of BPR in the construction industry. The queuing theory is employed to quantify the process operation time, which is important to the process efﬁciency of the proposed Construction Management Process Reengineering Performance Measurement Model (CMPRPM). Finally, target achievement matrices are deﬁned to evaluate BPR performance improvement. A construction company was selected as a case study to test and verify the CMPRPM model. 2. Model knowledge 2.1. Business process reengineering BPR, a strategy-driven organizational initiative designed to improve and redesign business processes, includes four major steps. These are process representation, process transformation, process valuation, and process redesign. 2.1.1. Process representation In process reengineering, one of the most difﬁcult and important tasks is to identify and describe a company's current process. Accurately describing the categorized operational process is an essential ﬁrst step in the reengineering program. Process representation develops a systematic deﬁnition for processes to assist companies to clarify and deﬁne current management processes. 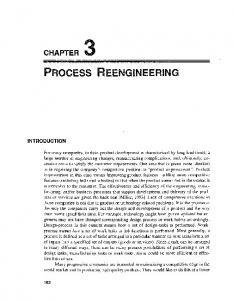 Two major sub-steps in this stage are clariﬁcation and process selection for reengineering. 2.1.2. Process transformation The transformation process mainly represents the application of the conducted operational analysis and process modeling. The primary purpose of operational analysis is to deﬁne a processes operational category and hierarchical structure. Process modeling is used to provide a comprehensive explanation of the relationship between operations. Many different methods and techniques, including IDEF, eEPC, Petri Nets, System Dynamics, Knowledge-based Techniques and Discrete-Event Simulation, can be used for modeling business processes in order to provide an understanding of potential improvement scenarios. The eEPC (extended event-process chain) technique employed in this study is composed of events and processes. Process modeling tools should be able to develop As-Is and To-Be models of business processes, which represent, respectively, existing and alternative processes. BPR seeks ﬁrst to deﬁne and understand the current As-Is business process and then, after modeling and analysis, formulates the future To-Be business process. 2.1.3. Process evaluation As reengineering activities focus on outdated and inefﬁcient processes in order to make changes that achieve the greatest impact, prior to execution, the present process must be reviewed to locate process barriers in order to ensure their targeting in process redesign. Process value (PV), used to evaluate process performance, can be viewed from either of the following two perspectives: (1) efﬁciency per unit of cost or (2) efﬁciency per unit of time. Time is an important factor that impacts upon cost as, the longer a process takes to accomplish, the higher the ﬁnancial price demanded. Evaluating performance to identify problematic areas related to these perspectives provides essential references that can be used to develop and implement a successful process reengineering strategy. present the main objects of Queuing theory interest . The theory was ﬁrst developed in “The Theory of Probability and Telephone Conversation” by a Danish engineer, A. K. Erlang, in 1909, when it was employed to study telephone system trafﬁc loads. After World War II, queuing theory was widely applied to various real-world challenges (e.g., computer networks, telephony systems, the Internet, industrial production lines) in various ﬁelds (e.g., hospitals, banks, airports, gasoline service stations). Inasmuch as abilities of the queuing theory, ALOHANET and ARPANET, which constitute the basis of Internet, were designed and analyzed with queuing theory. Queuing theory mainly focuses on the steady state of an inspected system with distribution functions of processes. After a sufﬁcient time, the queuing system will stabilize and become independent of its initial conditions. Mathematical probabilistic models for the analyzed queuing system can be formed with assumptions of process distribution functions . The common link between the various applications and ﬁelds that apply queuing theory is that they all deal with customers who join a queue to wait for some desired service (see Fig. 1). Identifying the point at which offered services and waiting customers achieve some speciﬁc balance and optimizing the beneﬁts of such represent the core objectives of queuing theory. The four components of queuing theory include: arrival pattern, service pattern, queue discipline, and system capacity. Arrival pattern typically describes the arrival time of two contiguous customers in the queue and service pattern describes one or more servers. Service time is deﬁned as the length of time required for a customer to receive a particular service. Both arrival and service times are characterized by distribution functions. Queue length represents the length of the queue in which customers wait. Queue discipline represents the order of who should be served ﬁrst and may be deﬁned by several discipline regimens, including ﬁrst come/ﬁrst served (FCFS), last come/ﬁrst served (LCFS), and service in random order (SIRO). System capacity represents queuing area/service facility capacity limitations. For example, while queuing at a gasoline service station, both the queuing area and service capacity are limited. However, system capacity limitations are usually ignored in queuing theory application. The symbol for queuing theory is usually represented by Kendall's Notation, which is composed of the ﬁve letters A/B/X/Y/Z, in which A means arrival time, B represents service time, X is the number of servers, Y is the allowable capacity for customers, and Z represents the adopted queuing discipline. Distributions for A and B are usually deﬁned as Markovian distributions (M), Deterministic (D), Erlang-k distributions (Ek), and General Independent (in order to discriminate between A and B, GI is used for A, and G for B). When Y is set at “inﬁnite” and Z at FCFS, the queuing model can be denoted by A/B/X. Buzacott  proposed using queuing theory as a facility for BPR performance evaluation. Queuing theory can explore the practical impact on system structures that derive from the radical changes effected by BPR. Fig. 1. One's queue for desired services. 3. Construction management process reengineering performance measurement (CMPRPM) model This paper employs BPR in the construction industry and evaluates the performance of such in implementation. The CMPRPM model, developed to quantify BPR performance, will be introduced in the following sections. Fig. 3. Project process queue. Fig. 2. Procedure of process operation time evaluation. Fig. 4. Servers idle verses projects queue. where Ca is the coefﬁcient of variance (COV) of the project arrival interval τ, ρ is the time usage rate, Cs is the COV of the project execution time S, and λ is the project arrival ratio. Through the equations above, the process operation time of a project can be calculated in forms of expected values and variances. 3.3. The customer satisfaction factor 3.3.1. Evaluation process for customer satisfaction The satisfaction of customer needs is the primary objective of process reengineering. To this end, the functional target of the process should be customer-oriented. In addition, the level to which the existing process already attains this objective should be assessed to identify existing problems and improvement goals. Using the quality function deployment method, this study transforms company policy and customer concerns into process targets. The target attainability matrix is proposed to examine the attainability of customer satisfaction for measuring process effectiveness. Main evaluation process steps are described as follows (see Fig. 5): 3.3.1.1. Deﬁnition of operational strategy and company policy. A company's operations can be viewed as a serial composition of processes, with each process required to achieve certain targets. In this framework, it is essential to consider company policy in tandem with the targets of each process in order to accomplish overall company policy objectives. Before analyzing the process, a company's operation policy must ﬁrst be deﬁned. Inclusion of policy demands when setting process targets is also essential to the realization of a company's operational strategy and customer needs. Fig. 5. Customer satisfaction evaluation procedure. and subcontracting processes of company “A” were completed preliminarily, so that the To-Be process models were created as alternatives for advanced evaluation and even implementation. The efﬁciency and the effectiveness were estimated with the queuing theory (GI/G/1 model) and the target achievement analysis respectively proposed in the CMPRPM. Once the performance of To-Be processes satisﬁed the decision makers of reengineering project team, the qualiﬁed processes could be considered for advanced implementation. Accordingly, the case with three main steps including (1) preliminary process reengineering, (2) process efﬁciency evaluation and (3) process effectiveness evaluation, were described. 4.1. 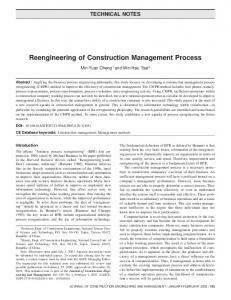 Preliminary process reengineering The construction management process reengineering model (CMPR) addressed by Cheng et al. 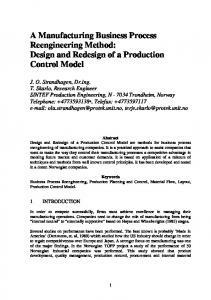 [4,5] were adopted by company “A” for creating the initial To-Be process models of the target reengineered processes. Based on previous process reengineering model, three main steps, namely, (1) process representation, (2) As-Is process analysis, and (3) new process design were completed subsequently. 4.1.1. Process representation The As-Is models of target reengineered processes were created in this step. The process data collection and process modeling were the two main tasks. For the study case, the As-Is process models were created with eEPC diagram of ARIS (Architecture of Integrated Information System) according to the ISO documentations and organization structure. Moreover, for the process efﬁciency evaluation with queuing theory, the detailed activity information, such as duration, service rate, etc., need to be surveyed additionally. Accordingly, for company “A”, the historical data, reviewed for a period spanning May 1999 to February 2001, provided statistical information on 21 biding projects, 8 successful bids, and 127 subcontracts (which provided the expected values and variance of arrival interval for this case) (see Table 3). Service rates for biding/contracting, budgets, and subcontracting processes were included. The activities information was summarized as shown in Tables 4–6; the original organization structure was illustrated as Fig. 6. Fig. 6. Company A organization prior to BPR. by As-Is and To-Be processes. The total process operation times of biding/contracting, budget and subcontracting processes are calculated in this section, with As-Is and To-Be execution times used to evaluate BPR implementation. In the following, the ﬁrst two procedures of As-Is biding/contract process are calculated as an example for process operation time calculation using queuing theory (GI/G/1 model). Fig. 7. Company A organization after BPR. evaluation of process execution performance or To-Be process optimization in order that business managers can clearly view differences between As-Is and To-Be processes. Therefore, the model proposed in this paper should serve as a valuable tool with which to facilitate a successful BPR design in the construction industry. References  M. Hammer, Reengineering work: don't automate, obliterate, Harvard Business Review 68 (4) (1990) 104–112. M. Hammer, J. Champy, Reengineering the Corporation—A Manifesto for Business Revolution, Harper Collins, New York, 1993. C.E.A. Fowler, C. Gray, S.J. Palmer, Searching for success: the relationship between information technology and business process reengineering, International Journal of Computer Applications in Technology 11 (6) (1998) 428–435. M.Y. Cheng, M.H. Tsai, Reengineering of construction management process, Journal of Construction Engineering and Management 129 (1) (2003) 105–114. M.Y. Cheng, M.H. Tsai, Z.W. Xiao, Construction management process reengineering: organizational human resource planning for multiple projects, Automation in Construction 15 (6) (2006) 785–799. S. Mohamed, S. Tucker, Options for applying BPR in the Australian construction industry, International Journal of Project Management 14 (6) (1996) 379–385. B.Z. Brown, J.J. Marston, Tennessee Department of Transportation's vision 2000: reengineering the project-development process, Transportation Research Record 1659 (1999) 129–140. 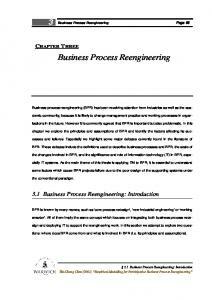 N. Abdul-Hadi, A. Al-Sudairi, S. Alqahtani, Prioritizing barriers to successful business process re-engineering (BPR) efforts in Saudi Arabian construction industry, Construction Management and Economics 23 (3) (2005) 305–315. H. Imanaka, N. Ikeuchi, A simulation system for evaluating operation ﬂow, Electronics & Communications in Japan, Part 1, Communications 80 (5) (1997) 11–22. Y. Hwang, R.A. Leitch, Balanced scorecard: evening the odds of successful BPR, IT Professional 7 (6) (2005) 24–30. X. Liu, Q. Li, Y.L. Chen, N.Y. Ma, H. Shen, Business process evaluation method based on balanced scorecard, Jisuanji Jicheng Zhizao Xitong/Computer Integrated Manufacturing Systems 9 (8) (2003) 661–665 (in Chinese). A. Arazi, E. Ben-Jacob, U. Yechiali, Bridging genetic networks and queueing theory, Physica A: Statistical Mechanics and its Applications 332 (1–4) (2004) 585–616. J.A. Buzacott, Commonalities in reengineering business processes: models and issues, Management Science 42 (5) (1996) 768–782. J.A. Buzacott, J.G. Shanthikumar, Stochastic Models of Manufacturing Systems, Prentice-Hall, New Jersey, 1993. 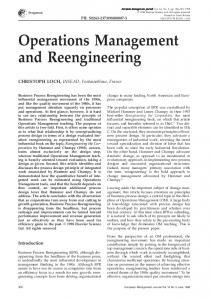 Report "Construction management process reengineering performance ..."